I Bleed Crimson Red: Beware the mighty Northwest Arkansas Thunder Chickens! Beware the mighty Northwest Arkansas Thunder Chickens! 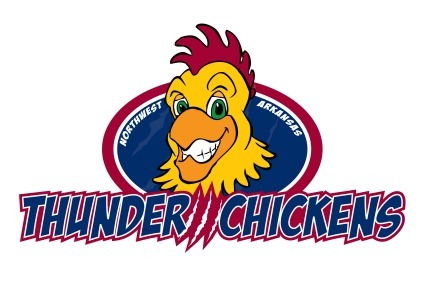 Any reference to the team inside Arvest Ballpark will be to the Thunder Chickens. Video boards will reference the Thunder Chickens. Jerseys and hats will bear Thunder Chickens logos. Local radio broadcast will refer to the team only as the Thunder Chickens. It's a unique way to celebrate the five years of the Naturals, er, Thunder Chickens in Northwest Arkansas. "Throwback uniforms are popular with a lot of teams, but we don't have that sort of history," Edelstein said. "So we thought it would be fun to explore one of the forks in the road we could have taken." More fun at Arkansas360.com, via Chris Bahn.